BEIJING, March 11 (Xinhua) — The powerful earthquake that hit Japan Friday afternoon will not affect the Chinese mainland “obviously,” though tremors were felt in parts of Beijing, top Chinese seismological official Chen Jianmin told Xinhua Friday. “But most parts of the Pacific region should keep vigilant against a tsunami triggered by the quake,” said Chen, director of the China Earthquake Administration, on the sidelines of the annual parliamentary session in Beijing. The 8.6-magnitude quake hit Japan’s northeastern Honshu island at 2:46 p.m. local time with a depth of about 20 km, according to China Earthquake Networks Center. The U.S. Geological Survey earlier put the quake at 7.9 magnitude but later upgraded it to 8.9 magnitude. The Japan Meteorological Agency revised the magnitude of the quake from 7.9 to a magnitude of 8.4. Chen said the Chinese public need not panic as Japan’s quake zone and the Chinese mainland are separated by a sea area and the quake will not affect the Chinese mainland obviously. Nevertheless, small tremors were felt in some downtown areas and suburban districts of Beijing Friday afternoon. Some residents in several high-rise apartment buildings in northeastern part of Beijing even rushed out of their buildings for safety concerns. A 5.8-magnitude quake jolted Yingjiang County of southwest China’s Yunnan Province near the border with Myanmar Thursday afternoon, leaving at least 25 people dead and 250 others injured. 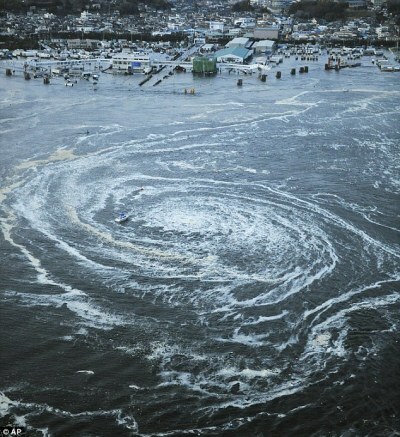 The tsunami that hit northern Japan today created an enormous whirlpool in a harbor off the east coast of that country. According to researchers, whirlpools aren’t unusual after waves of this size. 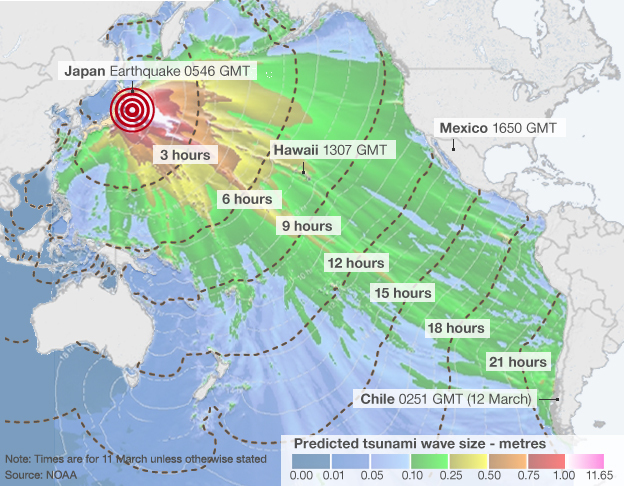 The tsunami was triggered by an 8.9-magnitude earthquake that struck off the coast of Japan at 2:46 p.m. Tokyo time. Video footage shows a boat swirling in the massive eddy. It’s not known whether anyone was on the vessel. Based on eye-witness accounts and video in recent years, whirlpools probably occur with some regularity after large tsunamis, said Ruth Ludwin, a retired seismologist at the University of Washington in Seattle. Whirlpools happen because of the interaction between rushing water and the geology of the coastline and seafloor, Ludwin said. The first images and videos of post-tsunami whirlpools came out of the 2004 Indian Ocean tsunami, Ludwin said. But eyewitness accounts from previous coastal quakes suggest that tsunami whirlpools are nothing new. One was reported in the great Lisbon earthquake of 1775, Ludwin said. The Haida people of the Queen Charlotte Islands off the coast of British Columbia have myths about a whirling wave of foam. Next Earthquakes : What can we learn from the devastation…?